Sto Family Members Win 2018 Entrepreneur of the Year - Sto Corp. The criteria for the “Entrepreneur of the Year” business awards includes exemplary entrepreneurship, innovative strength, and outstanding personal commitment. This year’s award for family business went to brothers Jochen and Gerd Stotmeister of Sto. Each year, the global auditing and consultancy firm Ernst & Young holds a competition encompassing 60 countries to recognize outstanding business performance in a number of categories including “Digital Transformation”, “Industry”, “Services”, “Consumer Goods/Retail”, and “Emerging Companies”. This year, the award for family business went to Jochen and Gerd Stotmeister in reognition of their leadership and management of Sto SE & Co KGaA, as they shaped and sustained their company, enabling it to be passed on to the next generation. The Sto success story began in 1936 when founder Wilhelm Stotmeister took over a local lime works and susbsequently pioneered the introduction of high-quality synthetic resin wall coatings in the European market. Today, Sto is the world leader in thermal insulation composite systems, and one of the world’s best-known manufacturers of quality claddings and coatings for buildings. At the end of 2017, the company had more than 5,300 employees and generated some 1.28 billion euros worldwide. Sto is still controlled by the founding Stotmeister family, and Jochen Stotmeister, the grandson of the founder is head of the supervisory board. He directed the company as CEO for many years – in close coordination with his brother Gerd, who until 2017 was the board member responsible for technology. A panel of renowned, independent judges selected the Stotmeister brothers as co-winners of the “Entrepreneur of the Year” title from among the 33 companies that made it to this year’s German final. The winners were announced at an award ceremony at the German Historical Museum in Berlin on the evening of October 19, 2018. Jochen and Gerd were also accorded another honor at the event. In June 2019, the Entrepreneur of the Year winners from the 60 countries will gather at a ceremony in Monte Carlo where the “EY World Entrepreneur Of The Year 2019” will be crowned. Daniel Krauss, André Schwämmlein, and Jochen Engert from FlixMobility will represent the German winners at the event. Jochen and Gerd Stotmeister from Sto have also been invited to attend the ceremony, where they will be inducted into the international “EY Family Business Award of Excellence” Hall of Fame. 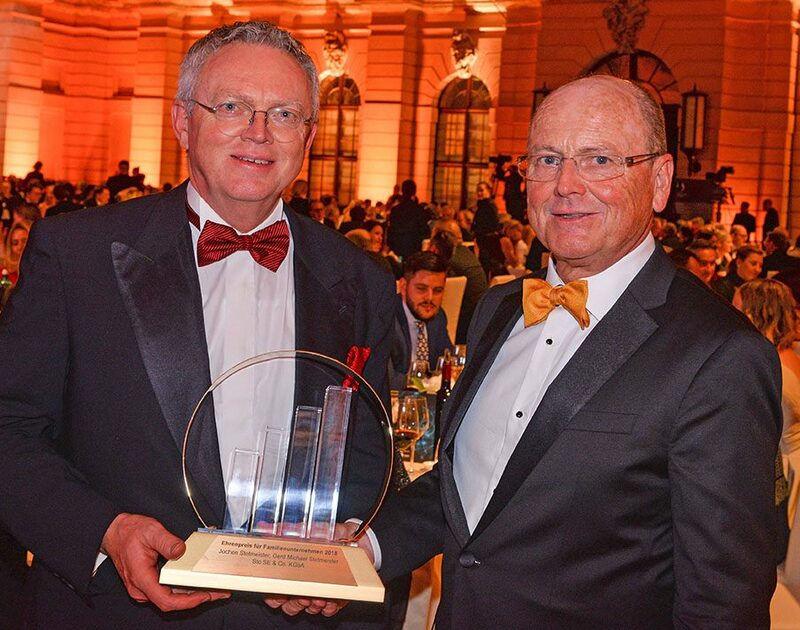 Gerd (left) and Jochen Stotmeister were delighted to receive the award for family business at the “Entrepreneur of the Year 2018” event.